Title: "Down to the Crossroads"
The first four issues of this series were a continuity insert by Alan Davis, and these two issues, also continuity inserts, are the final two of the series. The series was actually meant to continue for at least one more story, but that story, by Jim Starlin, was rebranded as a separate miniseries called Thanos vs. Hulk (which wasn't a continuity insert). Alan Davis and Jim Starlin are of course well known industry veterans. By contrast, the creative team for this book was relatively unknown. Gabriel Hardman, the main creator here (he's artist and he's listed first as writer) came from working as a storyboard artist for movies; the title page cites his work on the second X-Men movie, Inception, and Dawn of the Planet of the Apes. What the title page doesn't mention (but which AF points out in the Comments) is that he previously worked as a comic book artist - including for Marvel's War Machine in the 90s - as Gabriel Gecko. Corinna Bechko seems to have worked mainly as co-writer with Hardman on comic book adaptations of movies. I passed on these issues when i was collecting Savage Hulk (and Thanos vs.) in realtime since i didn't know the creators, but i instantly regretted it since the story takes place during a unique period in the Hulk's history: The Crossroads era. The story begins with Dr. Strange testifying before a committee at the Rayburn House Office Building in Washington DC. Note that care is taken to inform those who would care about such things (i.e. me) that this is not the same committee we saw in Hulk #304. 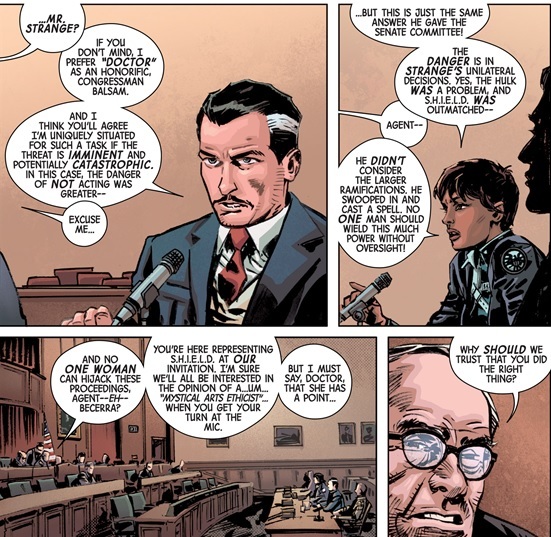 That was the senate committee; the SHIELD agent here, Agent Becerra (SHIELD's one and only mystic arts analyst), is complaining that Strange is repeating his testimony from that committee. This committee is interrupted by another dimension's Sorcerer Supreme. Actually, only Strange can see the creature, which claims that Strange is responsible for allowing the Hulk to rampage and kill on his world. Strange considers this impossible since he says that he didn't give the Hulk access to any world where he could harm sentient beings. I think that's debatable; the Hulk certainly encountered plenty of sentient beings during his time in the Crossroads. 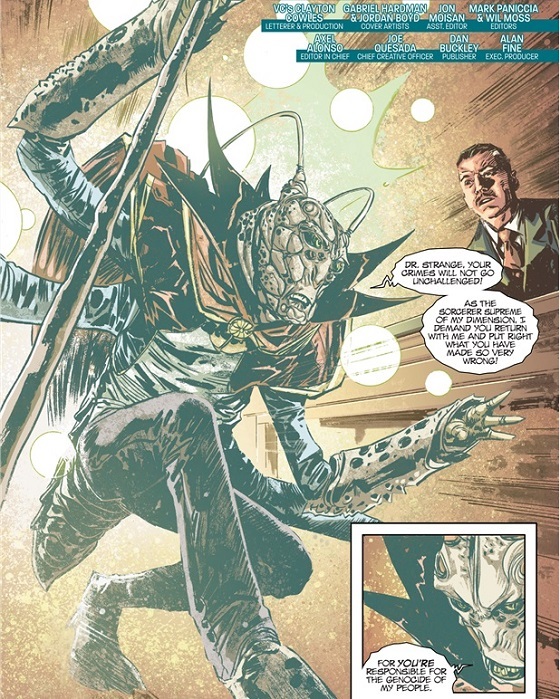 But he did seem weirdly underpowered in all of those encounters, so maybe Strange had ensured that he could only access dimensions where the residents were more powerful than they looked. 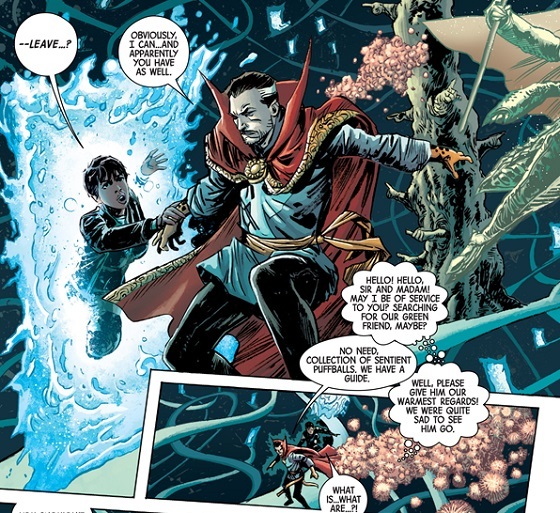 Strange follows the Sorcerer Supreme, Master Ebbin, through a dimensional portal, leaving a surprised committee behind. But Agent Becerra follows. Note the cameo by the Puffball Collective. Master Ebbin brings Strange and Becerra back to his world. Ebbin leaves his (sinisterly grinning) apprentice Korv in charge of his Sanctum while he leads Strange and Becerra to where the Hulk is rampaging. They fly through a city protected by a giant wall and into the wilderness where a robot prepares to attack the Hulk. Ebbin says that his people have been dealing with the Hulk for "generations" and indeed it was the Hulk that caused Ebbin to pursue the mystic arts (Strange is surprised by the "generations" line, but it seems pretty clear, given that they are bug people, that they have short lifespans relative to humans)(also, i thought it was a bit incorrect for a different dimension's Sorcerer Supreme to be wearing very similar clothes to Dr. Strange, but if Ebbin was influenced by Strange that's a different matter). Strange confirms that we're definitely dealing with the Hulk. Strange wonders why the failsafe aspect of the spell that causes the Hulk to return to the Crossroads when he's unhappy with a world didn't get triggered, but Ebbin points out that the Hulk enjoys being here. Ebbin is frustrated that he can't get Strange to believe that the Hulk is committing genocide, and then he suddenly dies of old age, warning "beware my success...". It's successor, obviously, but Strange doesn't figure it out. 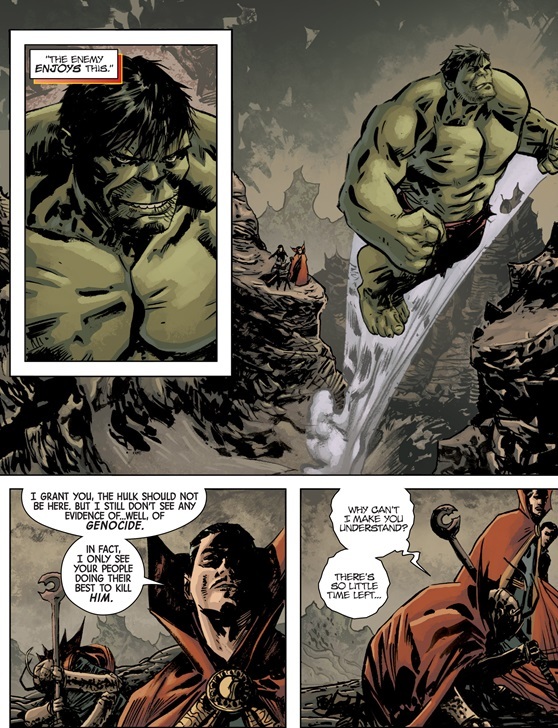 Strange tries to approach the Hulk to ask what is going on, but the Hulk remembers Strange's involvement in his banishment and attacks. 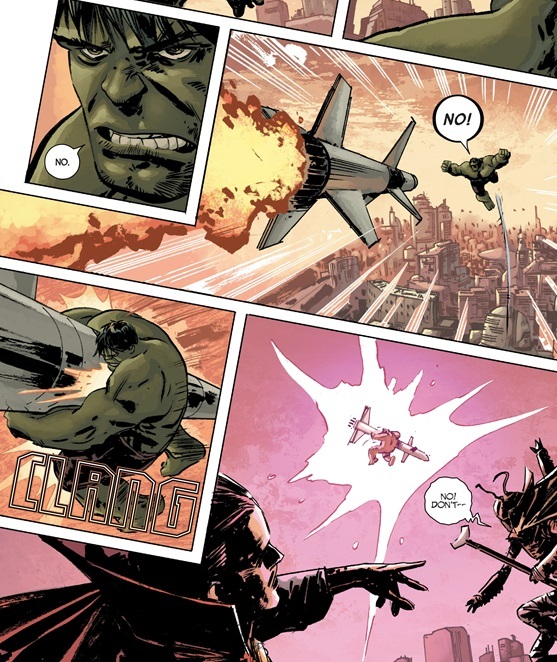 Strange tries to send Hulk back to the Crossroads but finds that a counterspell is preventing him (Strange says that the failsafe that would cause the Hulk to return to the Crossroads if he wanted to is still in effect, though). Becerra notices something about the piles of skeletons that the Hulk is living among, but doesn't have time to say anything. She's interrupted because when they return to the city, they find that it has advanced tremendously in technology since they've left. They also find that Korv is super old. It takes a little more talking but Strange finally figures out the lifespan thing, and realizes that the Hulk only killed Ebbin's people before they became sentient (he ate them for food, and it's worth noting that the creatures turn out to be more like shrimp than bugs, continuing my amended theory that the Hulk is a pescatarian; in the present day portion of this story he only eats fruit). 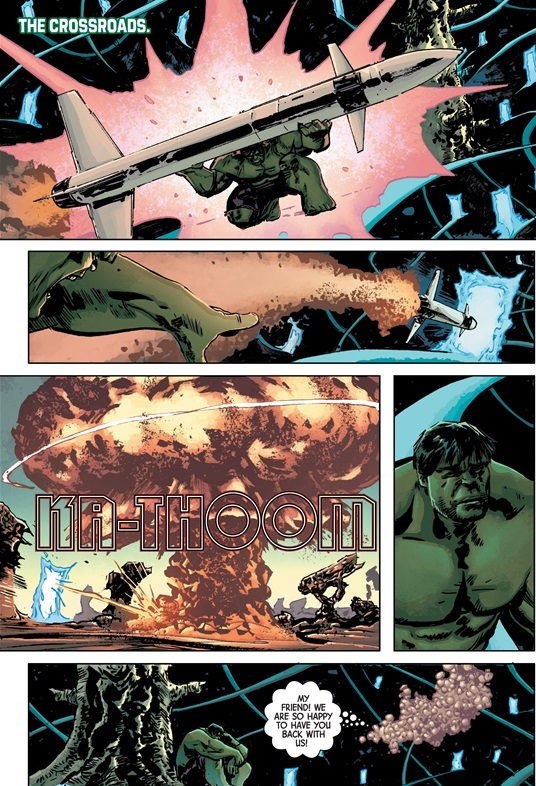 But to Korv, the Hulk has "always" been an enemy, and they've now developed a Gamma Bomb to kill him. 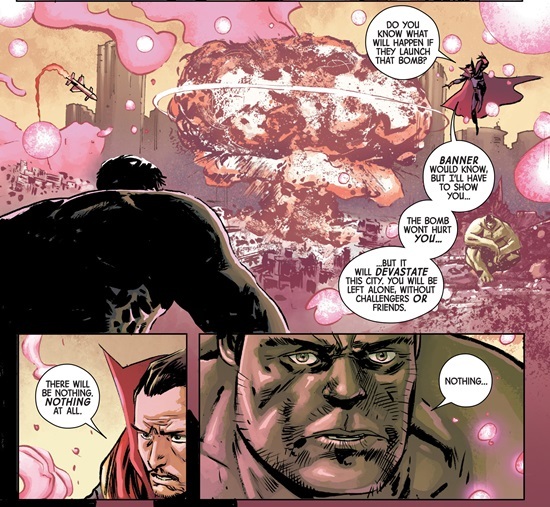 Strange says the bomb won't kill the Hulk but it will wipe out their civilization. And Korv is actually aware of this, but wants to further influence the evolution of his people. Becerra convinces Strange that battling Korv is pointless since they are both such strong mages. So Strange goes to the Hulk and convinces him that the detonation of the Gamma Bomb won't be good for him. ...and returns to the Crossroads and throws it into a different dimension. Looks like an unpopulated one, but who knows. Strange then exposes Korv's actions to the rest of his people, and then he and Becerra return to Earth, where it turns out that two days have passed. Becerra now vouches for Strange, seemingly ending the inquiry. I had mixed hopes for this and i come out still feeling ambivalent. I love that the story takes place during the Crossroads era, and Hardman & Bechko did seem to take care to not contradict anything continuity-wise. So the "first, do no harm" hurdle is passed, at least. The story itself is a bit obvious, with Strange having to be dumber than usual for the plot to deliver its twist. But it's not terribly out of place compared to the other Crossroads era stories. The art is bland and subdued, typical of its time period for Marvel. It does have a more traditional flow to it, but the static dullness of the action works against it. The characters involved obviously don't lend well to demonstrating great characterization skills or snappy dialogue, but that means we're left with a by-the-numbers rendition of an easy-to-guess plot. I was right to skip this in realtime, but it's nice to have it included in my project. Chronological Placement Considerations: Takes place after Hulk #300, obviously. More specifically it takes place after Hulk #304 and before the death of the Puffball Collective in Hulk #308. The Hulk's intelligence - he speaks a little and has the ability to reason without guidance from the Puffball Collective - feels just slightly higher than he should have at this point - he really starts to show intelligence after the death of the Puffballs - but it fits pretty well after Hulk #306-307, which did have the Hulk speaking a bit. And that fits in a period where Dr. Strange didn't have any special considerations. One interesting note is that in Marvel Fanfare #20 there's a line about Dr. Strange having found a spark of Bruce Banner's intelligence while "monitoring" the Hulk in the Crossroads. 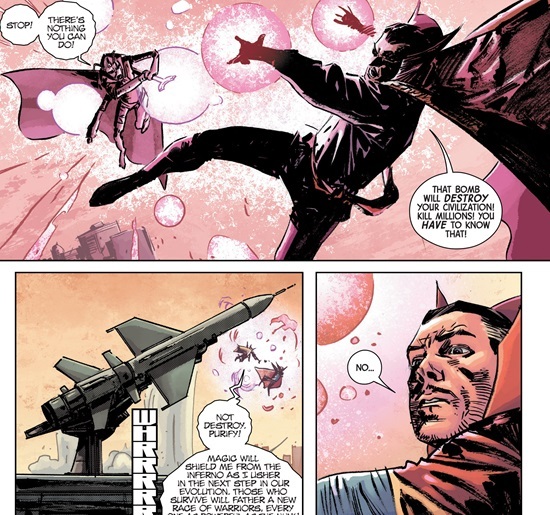 In this story, Strange tries to reach out to see if anything is left of Banner. He doesn't seem to find anything but doesn't explicitly say that he doesn't, so it's possible that he did detect the "spark" here, leading to the Fanfare story. Two days pass (on Earth) during the course of this story. Dr. 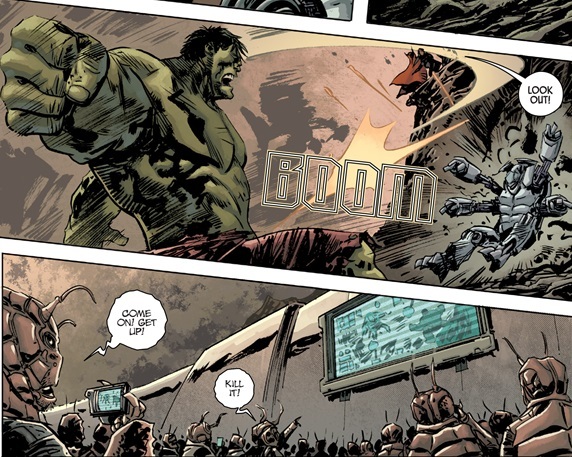 Strange banished the Hulk to the Crossroads in Hulk #300. The title is, of course, from Eric Clapton’s rendition of Robert Johnson’s classic “Cross Road Blues”. Gabriel Hardman is also Gabriel Gecko (from the 90s War Machine series), if you want to do a Jim Owsley/Christopher Priest for him. Thanks AF. I'll list him as Hardman (and hopefully won't forget if i add more War Machines).